Subaru of Glendale was in a challenging market with many competitive dealers in the surrounding cities. 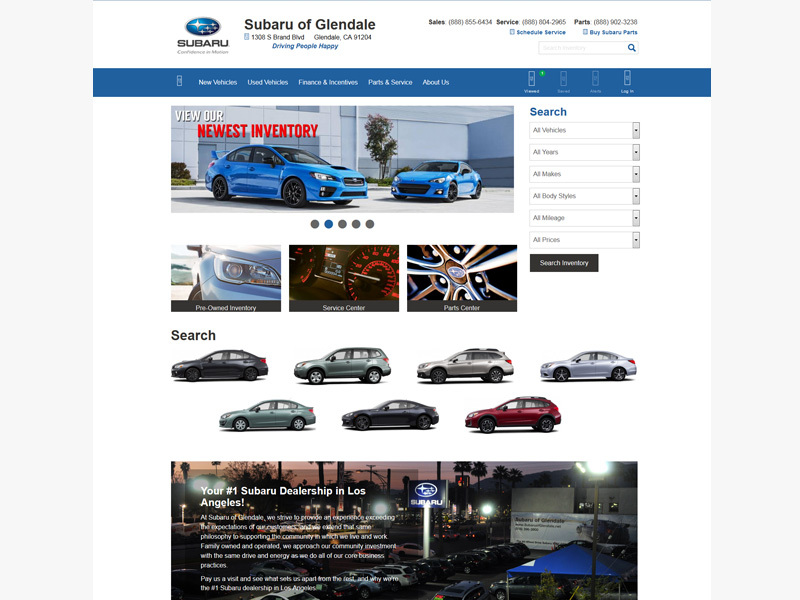 They established the objective of increasing their website traffic, and its conversions, in the process of meeting their overall business objective of being Southern California’s #1 Subaru Dealer. Their existing site needed many touch-ups to differentiate itself from competitors, as well as put more focus on the specific dealership and its offerings. After discussing their short-term and long-term goals, we decided on a website face-lift for improving the visual appearance and UI of the site, a well as an overall marketing package. As a result of a comprehensive marketing package including SEO, their site not ranks #1 in search engines for competitive words such as “Los Angeles Subaru”, and “Los Angeles Subaru Dealer” among the many. The additions of Social Media services, a consistent blogging system to keep users in tune with news an events, and call-to-actions on the site resulted in almost a 50% increase in conversion rates.